It is estimated that as many as 80% of us will have some form of back or neck pain at some point in our lifetimes. The good news is that most of us will recover without the need for surgery. Conservative care, such as physical therapy for many types of back pain, provides similar results to those obtained from surgery. 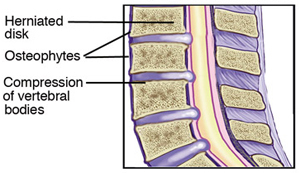 Degenerative disk disease (DDD) can be one cause of back and neck pain. However, DDD is part of the natural aging process, like getting gray hair, and in many cases is not painful at all. Your spine is made up of 33 vertebrae that are stacked on top of one another. Between each of these vertebrae is a rubbery piece of cartilage called an "intervertebral disk." 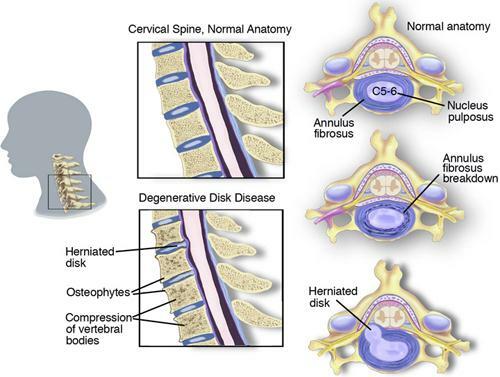 (See images: Degenerative Disk Disease - Cervical | Lumbar.) Imagine the disk as a tire, with gelatin filling the hole in the tire. The tire is called the "annulus," and the gelatin is called the "nucleus." When we're young—under 30 years of age—the disk is made mostly of gelatin. As we age, and sometimes with injury, we start to lose some of that gelatin and the volume of the disk decreases, resulting in less space between the vertebrae. The disk becomes flatter and less flexible, leaving less space between each set of vertebrae. Sometimes bone spurs form in response to this degeneration of the disk, which could make the spine stiff. Often, this flattening and additional stiffness to the spine is not at all painful. However, in some cases, when the rough surfaces of the vertebral joints rub together, pain and inflammation may result. The nerve root, the point where a spinal nerve exits the spine and extends to other parts of the body, may become irritated or compressed. 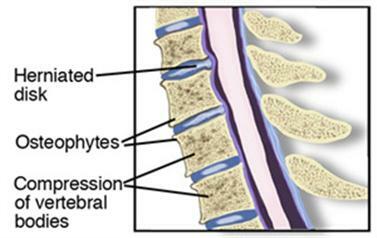 Disk degeneration may occur throughout several regions of the spine, or it may be limited to 1 disk. Degeneration does not always lead to pain. For some people, however, it can cause a great deal of pain and disability. The pain is often made worse by sitting, bending, and reaching. It may be worse first thing in the morning and after staying in any one position for a long time. In severe cases, when DDD results in pressure on the nerve root, it can lead to numbness, tingling, and even weakness in the arms or legs. If you have muscle weakness, loss of sensation, or severe pain, diagnostic tests, such as an X-ray or MRI, may be needed. However, X-ray evidence of wearing in the joints of the spine is found in people with back pain as well as in many who have never experienced back pain. Studies have shown that disc degeneration is present in 40% of individuals under the age of 30 and present in over 90% of those aged 50 to 55 years. Do not panic if your X-ray or MRI shows “problems” with your discs; these are normal changes that happen from the age of 20 years and onward. Physical therapists work closely with physicians and other health care providers to make certain that an accurate diagnosis is made and the appropriate treatment is provided. Research shows that in all but the most extreme cases (usually involving muscle weakness or high levels of pain), conservative care, such as physical therapy, has better results than surgery. Research also shows that results from conservative care and surgery are the same after 18 months post operatively. After the evaluation, if your physical therapist suspects you have DDD and there are no major medical problems, treatment can begin right away. Stretching and flexibility exercises. Your physical therapist will teach you specific exercises to improve movement in the joints and muscles of your spine, arms, and legs. Improving motion in a joint is often the key to pain relief. Strengthening exercises. Strong trunk muscles provide support for your spinal joints, and strong arm and leg muscles help take some of the workload off your spinal joints. Aerobic exercise. Regular aerobic exercise, such as walking, swimming, or taking a low-impact aerobics class, has been shown to help relieve pain, promote a healthy body weight, and improve overall strength and mobility—all important factors in managing DDD. This might sound like a lot of exercise, but don't worry, research shows that the more exercise you can handle, the quicker you'll get rid of your pain and other symptoms. Manual therapy. Your physical therapist may apply manual (hands-on) therapy, such as massage, to improve movement in stiff joints and tight muscles that may be contributing to your symptoms. Posture and body mechanics education. Your physical therapist may show you how to make small changes in how you sit, stand, bend, and lift—even in how you sleep—to help relieve your pain and help you manage your condition on your own. Note: Studies show that recurrence of neck and low back pain is common when a condition such as DDD is not properly treated. Regular performance of the exercises your physical therapist chooses for you is extremely important to make sure your pain does not return. Exercising in water can often be a great way to stay physically active when other forms of exercise are painful. Exercises involving repetitive twisting and bending need to be performed with some caution. If you start to notice some aching or pain after exercising, consult with a health care professional, such as a physical therapist, who can improve the way you move—and help reduce or eliminate your back or neck symptoms. Weight-training exercises, though important, need to be done with proper form to avoid stress to the back and neck. Your physical therapist will work with you to ensure your weight training is safe and effective. Jim is a 52-year-old construction worker who recently began feeling dull pain in his low back after a full day at work. Over the past few days, his pain has gotten worse. It is now spreading down the back of his thigh and into his left knee. He is surprised to note that the pain gets worse when he’s sitting; he can’t sit for more than 10 minutes without experiencing both back and leg pain. This is not the first time Jim has had pain, but it's the first time the pain is bad enough for him to seek treatment. His neighbor recommends a physical therapist in his community who has helped her with her back problem. Jim's physical therapist performs a thorough evaluation and asks him many questions about his health, his pain, and his lifestyle. He admits he gets no regular exercise except for the physical work he does on the job. His physical therapist also determines that he is 20 pounds overweight. She notes that he has some numbness in addition to his pain. She conducts tests to determine the severity of his condition and evaluates the strength of his muscles and the mobility of the joints of his back. She diagnoses degenerative disc disease, and explains the condition can develop with repeated stress on the back, and with age. During Jim's first treatment session, his physical therapist carefully explains some of the reasons for his current problem and discusses the importance of special exercises to relieve his pain. She shows him how to manage his pain by making simple changes in how he performs his daily activities, and teaches him the best positions to use for lifting on the job. She performs a hands-on (manual therapy) technique to his low back, which completely relieves his back and leg pain. Finally, she gives Jim special exercises to do at home, and encourages him to begin a walking program. Jim follows the advice of his physical therapist and, after 3 weeks of treatment and careful use of his home-exercise program, he is free of symptoms. Jim is now committed to a program of regular exercise and activity because he feels better than he has in years. He makes an appointment to return to his physical therapist in 6 weeks to review his exercise program and make sure that he is staying on track with it. Just this past weekend, Jim hiked to the top of a local overlook with his newfound outdoor exercise group! A physical therapist who is experienced in treating people with pain, orthopedic, or musculoskeletal, diagnoses. When you contact a physical therapy clinic for an appointment, ask about the physical therapist's experience in helping people with DDD. The following articles provide some of the best scientific evidence related to physical therapy treatment of degenerative disk disease. The articles report recent research and give an overview of the standards of practice for treatment of DDD both in the United States and internationally. The article titles are linked either to a PubMed abstract of the article or to free full text, so that you can read it or print out a copy to bring with you to your health care provider. Macedo LG, Maher CG, Latimer J, McAuley JH. Motor control exercise for persistent, nonspecific low back pain: a systematic review. Phys Ther. 2009;89:9–25. Free Article. Beattie PF. Current understanding of lumbar intervertebral disc degeneration: a review with emphasis upon etiology, pathophysiology, and lumbar magnetic resonance imaging findings. J Orthop Sports Phys Ther. 2008;38:329–340. Free Article. Chou R, Qaseem A, Snow V, et al. Diagnosis and treatment of low back pain: a joint clinical practice guideline from the American College of Physicians and the American Pain Society [published correction appears in: Diagnosis and treatment of low back pain. Ann Intern Med. 2008]. Ann Intern Med. 2007;147:478–491. Free Article. Roh JS, Teng AL, Yoo JU, et al. Degenerative disorders of the lumbar and cervical spine. Orthop Clin North Am. 2005:36:255–262. Article Summary on PubMed.